Per Rick Carpiniello (subs. req’d), the Rangers are set to sign prized prospects Vitali Kravtsov (1st, 2018) and Igor Shestyorkin (4th, 2014) to entry level deals. The deals cannot be announced until after May 1, when their KHL deals expire. 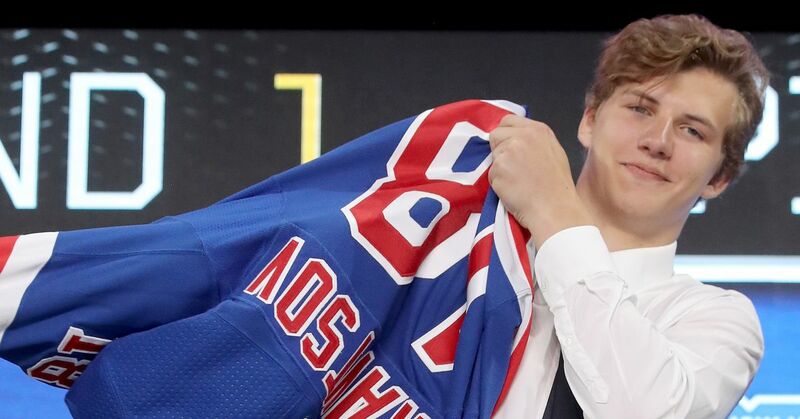 The Blueshirts’ 9th overall pick in 2018, Kravtsov made most Ranger fans for “Oliver Who?” after a few months this season. Kravtsov’s highlight reels on Twitter went around quickly, and his line of 8-13-21 in 50 games with Traktor in the KHL was good for 3rd on the team. Pretty good for an 18 year old in a league filled with grown men. Kravtsov is expected to compete for a top-nine role immediately. Shestyorkin, the heir apparent to Henrik Lundqvist, has posted stellar numbers in the KHL, most recently a 1.11 GAA and .953 SV% this season. It is expected that Shestyorkin will compete with Alex Georgiev for the backup spot next season, however the prospect is on record saying it is unfair for him to demand a KHL-out clause and he will gladly spend time in Hartford. "Report: Rangers to sign Igor Shestyorkin and Vitali Kravtsov", 5 out of 5 based on 17 ratings. Thumbs up for the random thumb generator script. …. as long as they don’t meddle in any elections or invade any other sovereign countries. Welcome Vito and Eyegor! AV, Mr. Turning the other cheek, is the new coach for the Flyers. Culture conflicts? Yes now with AV as coach..Gritty the mascot will have to chance his name to Softy.